Michael: We'll learn most of these licks in the following lesson. Let's try the first rhythm. Michael: Notice how we play an "A" chord with a single finger. Michael: Notice how the position changes ascending up the neck. You pick single notes on the "A" (5th) in between each of the chords in the following exercise. 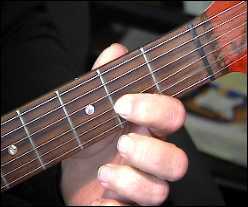 Michael: Try to get use to alternate picking the single string (A) and then chords that ascend the neck, the video should help show the picking pattern. finn: Muting the A ? Michael: For the chords you can, but you need that string to drone throughout the riffs. Michael: Try adding other chords with that pattern. Buud: Are you alternate picking the A drone, or all downstrokes? Michael: Buud yes, I'm using alternate picking, the picking video I gave you earlier should help. Teacher: Here's a jam track to play along. Michael: You can also change the chord pattern as well, here's one variation. Michael: Next we'll add guitar licks between these rhythms. 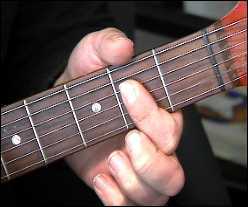 Most of these chords are 5 chords, this eliminates any major or minor 3rds. For this riff we'll use the A minor (Aeolian) scale. 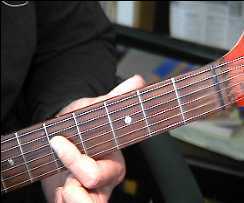 Michael: Notice how the A minor sequence uses hammer and pull-offs, the video shows the lick played at regular speed. Use the tab and the Riff tools to slow down the licks if you have any problems learning these licks. Once you get this down try playing to the jam track, notice how I use my finger combination. I mostly use the 1, 2, & 4th fingers. Let's try another lick/rhythm combination. Michael: Here's another typical Randy Rhoads type run using triads, notice the classical type sound Randy produces when playing triads using a hammer/pull-off combination. Michael: This stuff is mixed with beginning to advanced type material, so hang in there if you get lost. 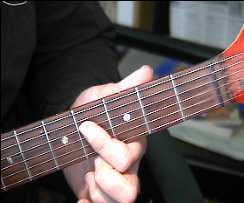 Now we can change the chords, this starts with the "A" then plays a "D" and moves up the fretboard. Michael: The first chord is the A, then it moves to the D with the open A which is the 1st interval of A. 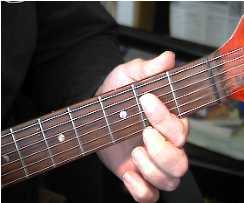 Now you can move the chord patterns up the neck. 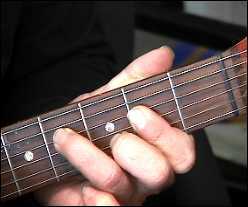 Michael: All you have to do is slide the chord pattern up the neck. Michael: Is that easy enough? Michael: Now you can apply the same picking pattern we used earlier by playing the single notes on the A then the chords. Michael: Here's the next tab. finn: Sounds like crazy train. Michael: Yep, same type riff, see how these chords fit together? Now try this combination. Michael: Now you can add licks in between each of these combinations. Michael: This is a simple pull-off pattern. Michael: It sounds fast because of the pull-off technique, here's the hand position. 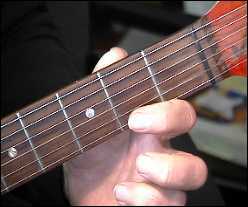 4th fret (3rd finger) -> 2nd fret (1st finger) -> open. 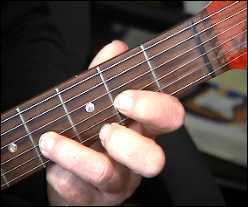 Michael: Just pull the fingers towards the bottom of the fretboard, you end on the A5 chord, here's another variation. Michael: Here's how all these licks and chords go together. Michael: It sounds like a lot, but break each of the licks down into sections to study. Michael: It takes time, I use to practice all the time, well time to go, see you next lesson!